Look, there's 6 hero circles! Update: Dota 6.61 6v6 is available! this map release by icefrog or someone else??? la lang mga pinoy dyan ui! 5th ahahaah ayos 2 ahh!! oo nga english kasi gamitin nyo mga tanga hahaha,,.. 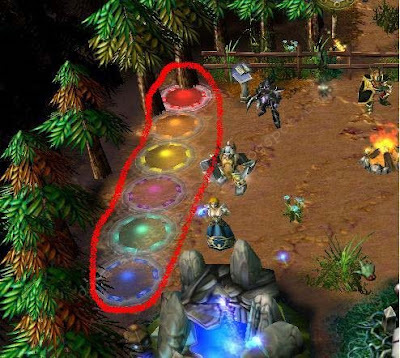 It looks cool but please use your brains and think... 6v6 is imba. 1st of all, the art of solo laning will be lost. I dunno. Hard to explain, but someone help me out here and explain why 6v6 is imba. I am 100% sure icefrog will never ever implement 6v6, unless a big change (bigger than 6.60 change) will be done. there is still the option for solo lane..
1 hero has just to pull and neutral..
cause a team with 6 AOE dmg & stuns is pure pain..
this map is great, whoever said that it will be official? its just for fun, for friends who are many..
personally i don't think it will be imba if there's 6v6, although the gold will be damn low,. i agree with the guy up there who says the game will last longer or end faster now, since the damage that will be exchanged between team clashes is now enormous..
also, more manpower per lane will be a lot more fun and either very helpful or devastating for the team, depending on the mix of heroes, anyway, to the Alief dude, where'd this come from? haha..this is gonna be fun..
Now playing with partner is nice, because the 3 lane could be controlled by the 2 player from Sentinel and Scourge. in my opinion, playing this map wil make the game longer, the starter gold will be too low to be even be able to buy any core items. 2 player lane will also make gold collecting harder. esp. if you are sharing a lane with a greedy person. and a winning team cannot end a game with only treads. Hahaha!! Good idea but i never think it will last though.